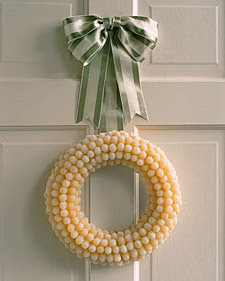 I've been seeing a lot of unconventional wreaths around and loving it. 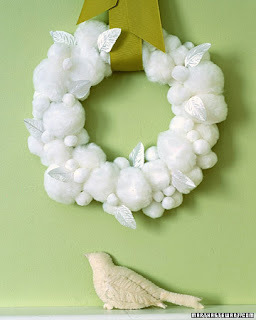 Look at this genius wreath made from brussels sprouts I saw on housemartin's blog! I (freakishly, I know) love brussels sprouts, so this wreath is somehow both adorable and appetizing to me. 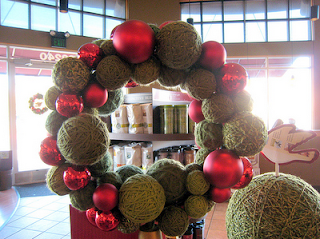 You probably recognize this yarn ball wreath from the door of your local Starbucks- good for them for coming up with something so clever and cute. It's as sweet as a venti gingerbread latte. These gumdrop and cotton-ball-and-white-pom-pom cuties are both from Martha Stewart. I've always loved the gumdrop one, but it seems like a lot of work spearing all those gumdrops into place, without any of the reward of getting to eat them. On the other hand the pom-pom wreath just seems like it would be a fun afternoon spent glue-gunning, albeit one resulting in very linty fingers. I haven't finished my own wreaths yet (far too lazy and behind in my decorating to start from scratch, I am just going to gussy up some evergreen ones I bought from a street vendor). I'll post photos this afternoon, once I have donned them in their gay apparel. Er, once they have donned their...Once their gay apparel has been donned. On them.